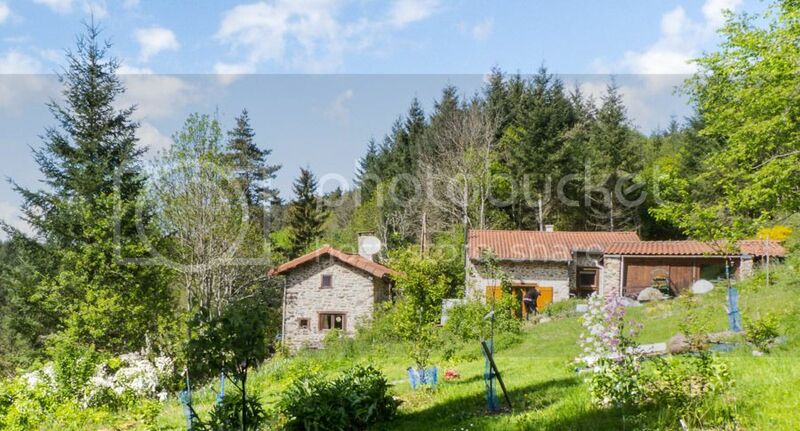 House for sale in Vals le Chastel, Haute-Loire, Auvergne, France. The house is situated at 750 metres of altitude on the edge of the forest, on a very minor road with the nearest neighbour over 300m away, a ceramicist and a graphic designer with small flock of sheep and a few goats. Main town (sub prefecture) Brioude is 20 minutes away. Nearest shops, boulangerie etc 15 minutes away. Open plan plus mezzanine and separate bathroom. Mezzanine has office area and bedroom area. This is where we put up any visitors so they are nicely self contained! New roof on storage side. Divided by beech hedging into an orchard and a pottager. Possibility of purchasing adjoining parcel (woodland).